MAPUSA: Salgaocar Football Club drubbed Guardian Angel Sports Club 4-0 in the Goa Professional League organised by GFA, at Duler stadium, here, on Friday. With Friday’s win, Salgaocar moved to 38 points from 17 matches while Guardian Angel remained on 21 points from 21 matches. It was braces from Ronaldo Oliveira and Devendra Murgaonkar which gave full points to Salgoacar who led 1-0 at half time. Salgaocar were steaming in confidence after their win over Vasco in the last match and it required the intervention of keeper Jeet Gupta who after sensing danger reacted quickly to stop Devendra in a one-to-one situation after being put through by Ronaldo Oliveira in the second minute. 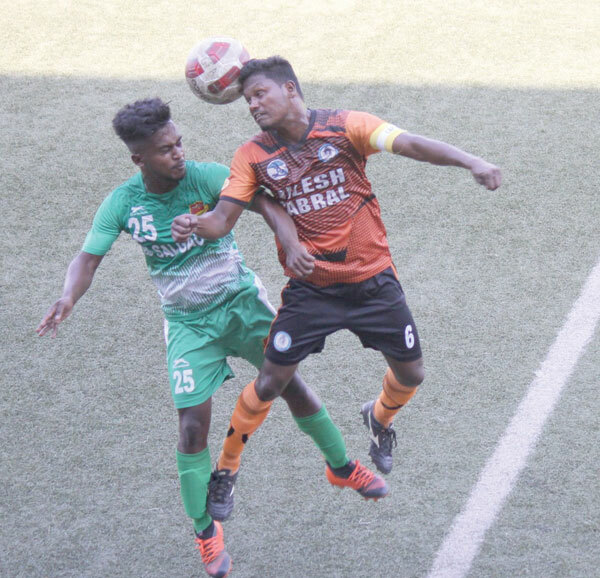 Devendra who was unlucky in the previous outing for Green Brigade found the same fate in the initial stages of the match when his decent attempt towards the goal was well kept out by keeper Jeet and then in the 10th minute was denied by defender Sarabjit Ram in a goal mouth scramble. Salgaocar finally tasted success in the 34th minute as Stephen Satarkar who had registered a hat-trick in the last match released a pass to Ronaldo whose clever cross found a well-positioned Devendra at the far end who without hesitation slammed the ball into the net. Angel’s almost restored parity within four minutes but Clinton Niasso’s firm header from James Fernandes’ cross was tipped out for a corner by diving Salgaocar’s keeper Nora Fernandes. Ronaldo almost doubled the lead in the 45th minute but his cracking 25-yard shot was brilliantly stopped by keeper Jeet for a corner. Selwyn who took the corner kick saw the ball curl into the net, but it hit Ronaldo and came back into play, which was surprisingly overlooked by the linesmen Kashinath Kamat, Salgaocar players and officials strongly appealed but the officials stood to their decision. Salgaocar began the second half brightly wherein Ronaldo got his brace with two quick goals in the 49th and 53rd minutes after being teed by Selwyn and Stephen. Devendra who seemed to have finally found his shooting boots made it 4-0 in the 58th minute for Salgaocar with a solo-run and then beating the onrushing keeper with a clever placement.